Despite having a menu each week, we hardly ever stick exactly to it. Sometimes, we're craving something else or plain don't want to eat what's planned. Sometimes I forget to defrost something or just don't feel up to getting involved in a complex recipe. One of these scenarios happens a couple times each week. I try to have a few specific ingredients on hand for back-up meals: there's always pasta sauce, canned soup, salsa, tortillas, bread, peanut butter, and lots and lots of glorious cheese. It's my crutch; well. . .that and the pasta. As such, I've become quite skilled at making a one-pot stovetop mac-n-cheese that's almost a complete meal. It's my go-to replacement meal. You can find the mac and cheese recipe at the end of this post, but let me first share our (proposed) menu for the week. As you might be able to tell, we had one of these weeks last week where we weren't in the mood for the menu-offerings. So, several of these menu items are repeats from last week. 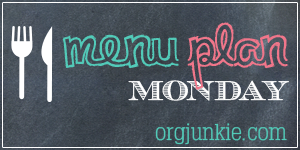 I'll be linking up with Menu Plan Monday at I'm an Organizing Junkie. As for the recipe. . .let me preface it with the fact that it's my own take on The Pioneer Woman's Fancy Mac and Cheese minus the baking. As well, I've shared a similar recipe of my own design previously. I called it Shrimp Mac-n-cheese with Bacon. 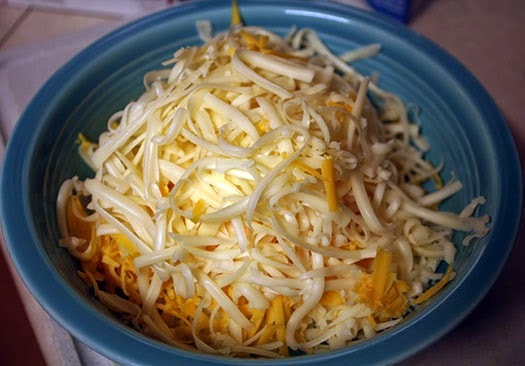 I like making pasta with cheese because it's so customizable. You can add meat or none, veggies or none, and use any combo of cheeses or pastas you have on hand. I've added camelized onions and smoked sundried tomatoes and sausage and numerous other concoctions to this basic stovetop mac-n-cheese. As well, I've reduced it by as much as 1/4th. The recipe I'm sharing today uses an entire box of penne pasta (so I really shouldn't call it MAC-n-cheese. . .but you get the point). A whole box is A LOT of pasta, more than the two of us could ever consume in one sitting. I'd say that this recipe probably makes about 6 servings, but I'm no nutritionist. I just know how much the two of us can eat. Okay. . .on with the recipe. 1. 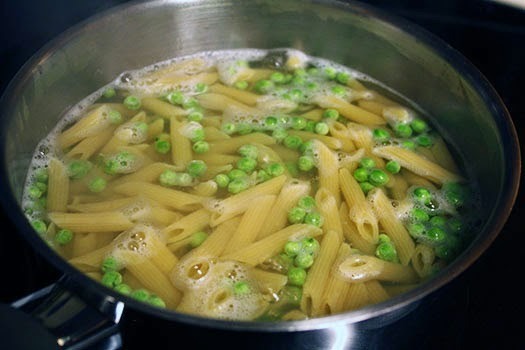 Boil pasta according to instructions on package, during the last 4 minutes add the peas. 2. Drain, reserving some of the pasta water. 3. Return empty pot to stove and melt butter on medium heat. 4. Whisk in flour and continue to whisk for a minute or two. Slowly add the milk, whisking the whole time. Let this cook for a few minutes to thicken slightly. 5. Remove heat, then add cheese(s) and seasonings. Stir until well-combined. 6. 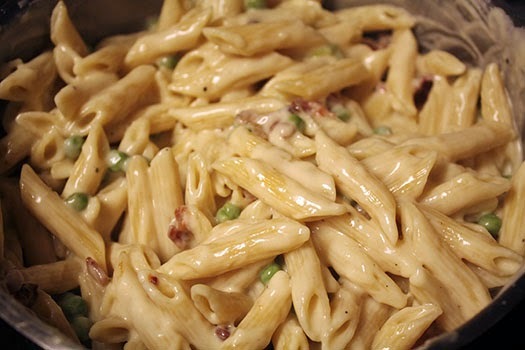 Add pasta/peas back into the pot with the cheese sauce, stirring to distribute the creamy goodness. 7. Add bacon to pasta, stirring to combine. 8. If the sauce is too thick, add a little pasta water at a time to thin it out. I seriously make this stuff way more often than I should, but it's so very good! Do you have a go-to recipe when you don't feel like cooking much else? I'd love to hear about it! Oh gosh that pasta looks so good! My husband is on a diet where he can't eat pasta, bread, potatoes, fruit and just about everything I like. He can only eat legumes, meat and one other thing-which I can't remember. I don't feel like making two meals and the cleanup of two meals. I also want to eat what I want but that brings me back to two meals and two cleanups.To be fair the diet is working for him but wow I'm so tired of beans! 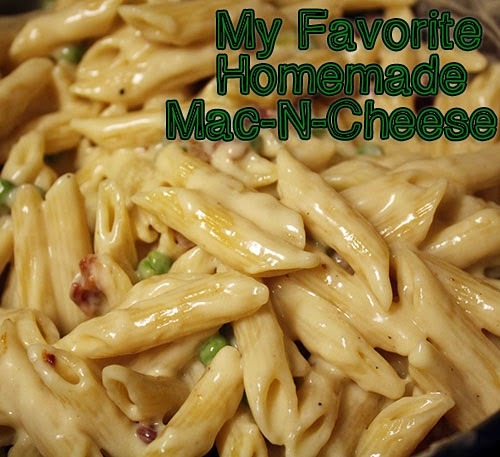 love the addition of peas to your mac and cheese! Jenna, I ALWAYS have a bag of frozen petite peas in my freezer for just this reason. It makes me feel like my mac-n-cheese has a little more of a healthy factor and makes it more of a complete meal. Ha!